I don't remember the first time I ate a summer cantaloupe boat, but I do know the attraction was immediate. That's surprising since it was a product of one of my mom's 1980's diets. She never did the grapefruit diet (too sour) or the cabbage soup diet (too bloating), but she did do the low-fat diet, which included rice cakes (a euphemism for styrofoam) and lots of low-cal cantaloupe. Cantaloupe has always been a good friend of those watching their weight because it's a high water-content food. That means it helps fill you up quickly without added calories and helps you minimize bloat naturally. With high levels of vitamin C, potassium, and fiber, it's also a powerhouse of nutrition. And let's not forget that a perfectly ripe chilled cantaloupe is irresistible -- delicate, juicy, and sweet. I don't diet. 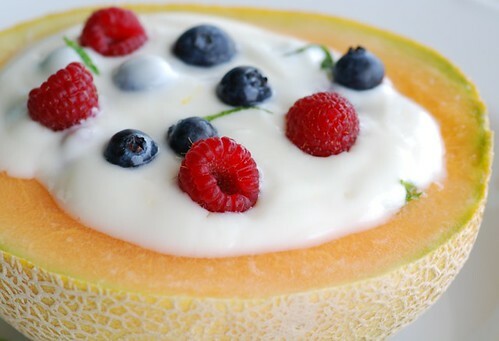 But I do love cantaloupe boats because they're healthy and refreshing on a hot summer day. And who wouldn't love that? These are highly versatile, so play around with ingredients you like until you find your favorite combination. 1. In a small bowl whisk yogurt, honey, mint, ginger, and lime zest. Gently stir in berries. Pour inside of the cantaloupe half. Enjoy. Try flavored yogurts, low-fat frozen yogurt, non-fat cottage cheese, or even sorbet. Try other fruits such as cherries, peaches, or kiwis or dried fruits such as apricots and raisins. Try orange or lemon zest. Sprinkle yogurt with granola, chopped nuts, or trail mix. Now this is a great idea! In South Africa we call it "spanspec", and we all love it. My best way to serve it is with Parma Ham! Sweet and salty, great combination! Delicious! I have 2 cantaloupe right now that I need to rid myself of...what a great idea. I'm a ginger fanatic and I love the idea of the sharp taste contrasting the sweet fruit. Canteloupe slices wrapped in proscuitto and grilled are absolutely divine. There are so many good melons out there too, well worth exploring- Charentais, Galia, Juan Canary, Santa Claus.... the tiny little Charentais are my favorite. Super sweet and delectable, and perfect for this method. What a perfect idea for a light healthy lunch. I need to try this, more importantly I would like to try to grow melons in my garden next year. So perfect for this time of year! I love it when people use the entire fruit/vegetable to hold food! It's creative and saves you some dishwashing! Healthy and light. something I need desparately! This sounds great. Seems like a simple yet very refreshing summer treat. Great photo - almost too pretty to eat! karine-It's definitely a seasonal treat. rose-I have never heard of "spanspec," but I do love it with proscuitto. Sweet and salty are best mates. joey-At it's so cooling and refreshing. tastyeatsathome-Hope you try some then! kate-Prosciutto wrapped melon is an old favorite that I grew up with. tw-The flavors are really lovely together. foodhunter-I like it cause it doesn't weight you down. Amber- Grow your own? That's even better! patsyk-It's the perfect summertime light meal. sal-It really is remarkably refreshing. Oh, yum! I'm a fan of the cantaloupe. My family used to serve it simply, dressed only with salt and pepper. It would be a major part of a light lunch. It was so easy to fill up on it - I loved it. When melons are on sale, this is one of my favorite ways to have breakfast. I rebelled against cantaloupe for a long time because when I was growing up it was my parents' idea of dessert. I wanted ice cream - you know, a REAL dessert! Now of course, fruit is totally my idea of dessert too and I love all melons. I'm a melon boat lover, but not a yogurt lover, so I tend to eat the melon boats as is, sprinkled with a bit of lime juice. Mmm, I feel healthier just reading your post. This looks delish! haleysuzanne-I know what you mean! They're wonderful in both sweet and savory dishes. Oh sure! Who wouldn't love this. So summery. Loving your cantaloupe - wouldn't have thought about putting yoghurt in it though!